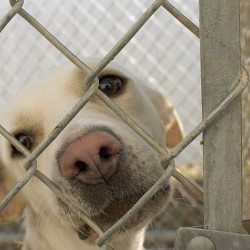 Cats that are seen as destructive to their owners home are at a 1.7-2 times higher risk of being relinquished than those who are not. Scratching is one of the most common ways for a cat to be viewed as destructive by their owner. Cats scratch not to destroy your furniture or annoy you but in order to satisfy innate needs. Scratching is a marking behavior; it allows the deposition of scent from special glands on the cat’s paws. It also removes the translucent covering, or sheath, over the claws. The scratch marks, along with the claw sheaths left behind, may also serve as displays of confidence. Identify your cats scratching preference: Does your cat scratch soft or hard surfaces? Do they like to scratch horizontally or vertically? Provide them with alternatives that match these preferences: for exmple, a cat that loves to scratch the drapes would prefer a post tall enough for a long stretch such as those that mount the wall or door. Most pet stores have a wide variety and friendly staff that will help you find something to suit your cats needs. 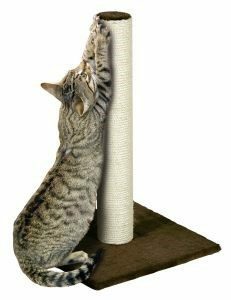 Design a scratching area for your cat: Begin with the new scratching post near by the cats old scratching location, slowly move the new post to the desired area (a little closer each day). Treats and praise should be given when the cat uses its new post. Make unacceptable items unavailable or less attractive to your cat: Making these items unavailable is often difficult or not possible. 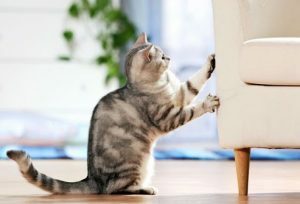 Setting booby traps (such as a tower of plastic cups that fall when your cat tries to scratch the item) may decrease the attractiveness of some items to your cat.Punishing a cat for scratching WILL NOT decrease their scratching. Cats are unable to link their punishment and to their bad behaviour. They will not understand why you are getting mad at them and may become afraid of you.